Anthony Hadro — who was born in Mexico City, moved to Brazil, and ultimately settled in Chicago — didn’t develop an interest in music until relatively late in life. His first instrument was the flute, but he ultimately settled on the baritone sax as his primary horn; he’s also fluent with the alto, tenor and both B-flat and low B-flat clarinets. As you listen to him, you’ll immediately notice the splendid tone achieved in all octaves of his baritone sax, which is the instrument (with a modicum of flute) that he uses on this release. Hadro attended the prestigious New Trier High School in Winnetka, Illinois, and New York City’s New School For Jazz and Contemporary Music; he was named salutatorian there in 2007, and soon thereafter toured with a jazz group containing several faculty members. He now teaches and tours with his own group, and with the Junior Mance Quintet. 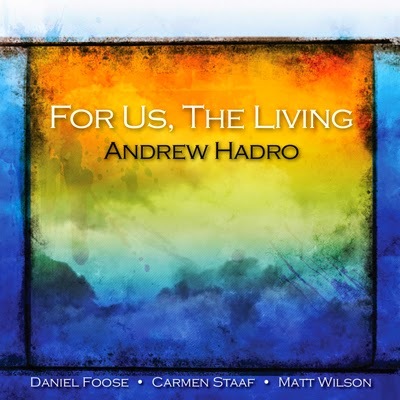 Hadro’s quartet here also includes Carmen Staaf, a superior musician who won the Mary Lou Williams piano competition in 2009, and is the pianist in UCLA’s prestigious Thelonious Monk Institute of Jazz Performance. The other players are bassist Daniel Foose and drummer Matt Wilson. Hadro wrote six of these 10 compositions. Of the rest, “Sea of Tranquility” comes from Maria Schneider, Julian Shore contributed “Give,” Ryan Anselmi wrote “Paola,” and “Cotton” was composed by James Davis. As for the results ... well, if you check the definition of descriptors such as class, smooth, sensitivity and inventiveness, you’ll probably find a photograph of this quartet. These folks produce some of the best modern jazz I’ve heard in years. Reviewing this combo was a genuine pleasure, and it’ll be my continued pleasure to replay this CD again and again.